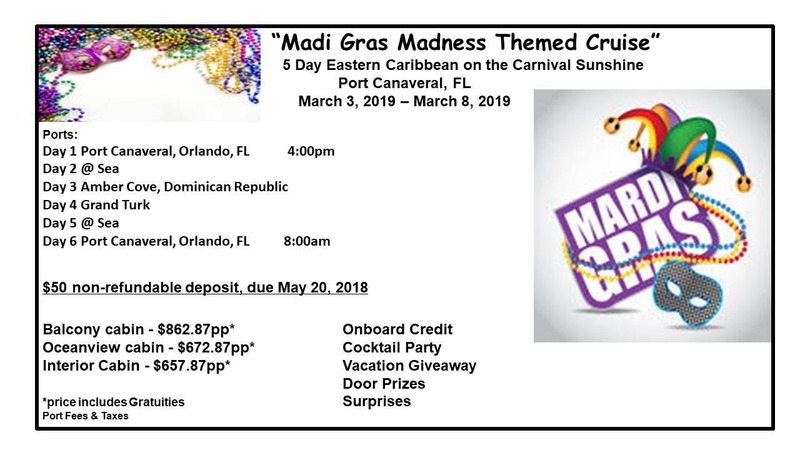 Celebrate "Madi Gras" onboard the Carnival Sunshine. Grab your Mask and some Friends and we will Party on March 5, 2019 New Orleans Style. Can't make it to New Orleans, don't worry we got you. We sail into Amber Cove, Dominican Republic and Grand Turk. Enjoy all the amenities of the Carnival Sunshine, from the Water works, Entertainment, Dining, Spa and kids clubs. It's fun for the whole family. "Madi Gras Madness"